← Done Writing Quality Content – What’s Next? 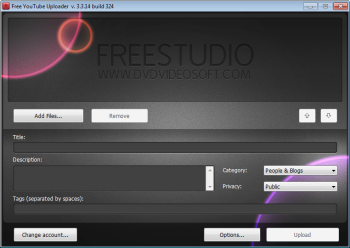 Free YouTube Uploader is the first PC desktop application to upload video to YouTube without using the original YouTube web interface. If you often upload videos, this program will be a good companion for you as it supports batch mode upload. Now Free YouTube Uploader is able to upload bigger files (up to 1 gb), to show real time progress of the uploading process as well as to set videos as private or public. This free program contains no spyware or adware. It’s clearly free and absolutely safe to install and run. This entry was posted in Uncategorized and tagged avi file upload to youtube, computer, flv file upload to youtube, free YouTube upload software, software, technology, youtube, youtube uploder. Bookmark the permalink.